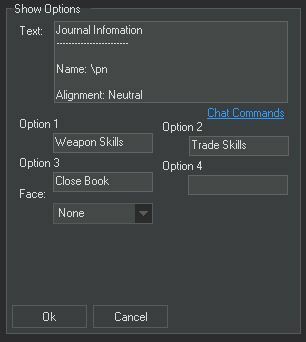 Player journal / trade-skill book that a player can click to open and display stats about character, but also showing in inventory book opening and closing. 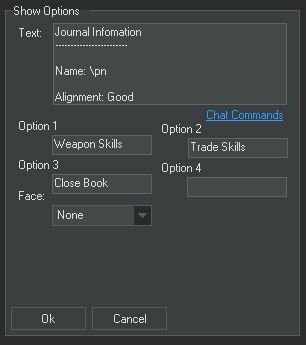 With in the trade-skill book on player information page the player can check character alignment which has been integrated with the journal system. It works by showing a page in the journal depending on what the players alignment points are at, this way the page can show the name of of the players current alignment such as: Divine, Good, Neutral, Evil, Demonic. 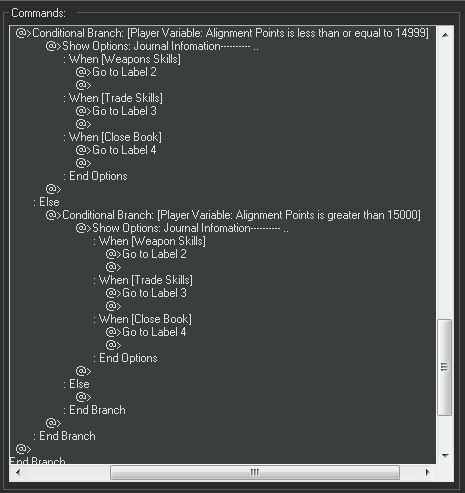 You can rip out the alignment system and just have the 3 pages to go to with no conditions on alignment needed. I just didn't want to rip it out to do a tutorial so left it in as a joint system. 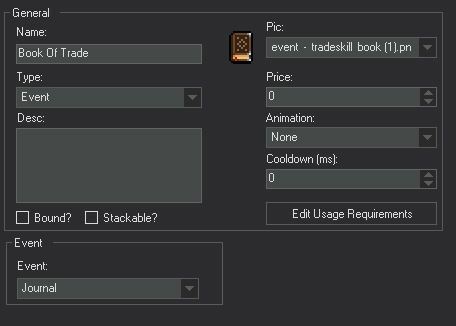 Click on trade-skill book item in inventory. 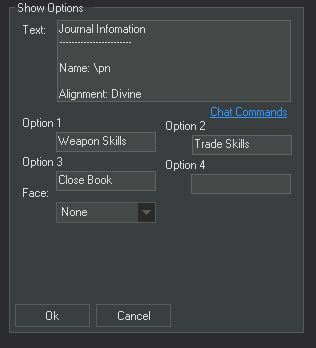 Each page can be customized the way you want, I did Journal Information, Weapon Skills, Trade Skills. 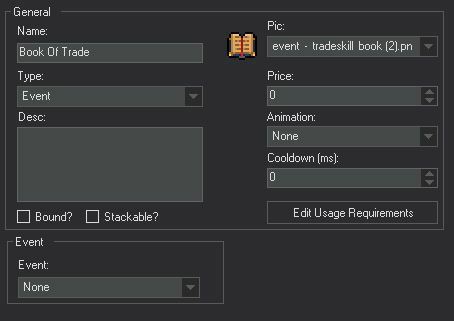 Close trade skill book closes book in inventory. NOTE: Switch is optional. I use it as at some point in my game the player will lose all ability to see stats and such. So the switch is optional to if you want to do that at some point in your game. If not then do not add the switch and later on when we come to making the common event just skip out the condition at the very beginning. Next we need a book with a closed and open state. NOTE: We have not created the "Event" yet so don't worry about the item type. We will come back to that. Now we have the items and variables created we can make the "Common Event". This will make the book look open in the players inventory. 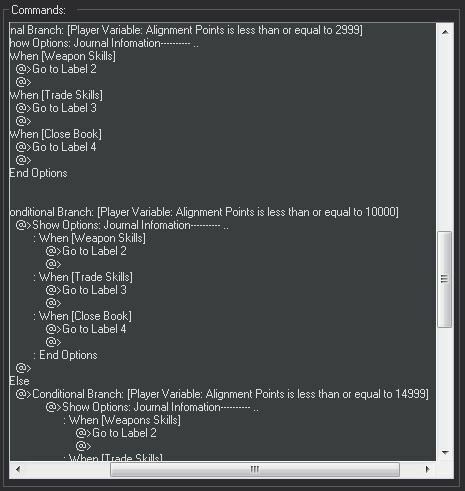 Based on alignment point value display an Option Set. Default page for opening a Journal is the "Journal Information" page. 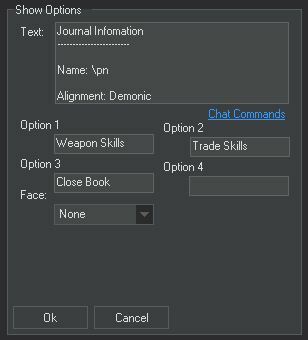 Button clicks on each page take you to a different page with in the journal: Journal Information, Weapon Skills, Trade Skills and Close Book. This will make the book look closed in the players inventory. Now for the beefy bit, building the "Common Event". 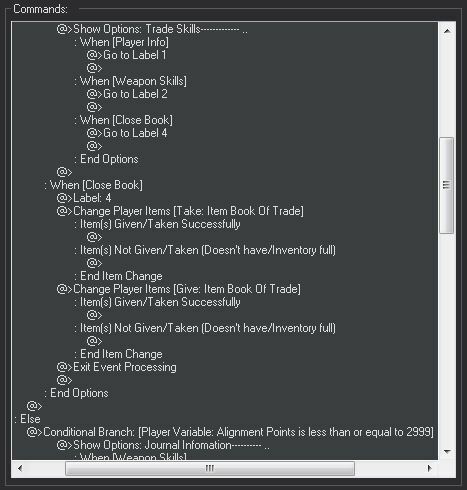 If you don't want the alignment system, then this bit will be short and only need to do the top bit up to the close book and swapping the player items and also remove the "Alignment Condition". If you do want the alignment system then copy the below in full. NOTE: We only set the "Common Event" to the "Book Closed" so that only runs the event. We do set the "Book Open" to a type "Event" so it is displayed as a "Special Item", but we do not apply an event to it. Now just give you players that "Closed Book" Item and they will have a wokring Journal to show additional player/game stats. 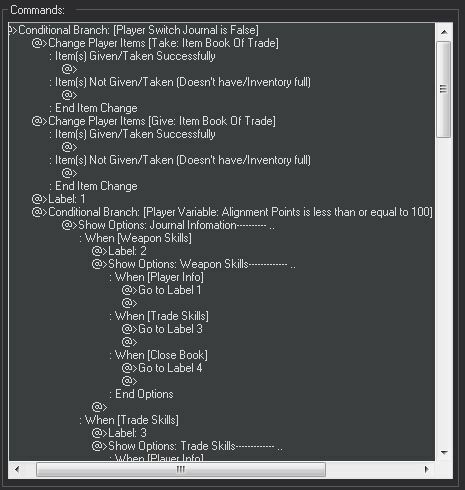 You could also bound the "Items" and set the "Closed Book" as a "Spawn Items" with in "Classes" so the player will have Journal from start of game, and will always have it. Cool way of doing this. Actually this helps a lot, im looking forward to your tutorials! Glad is helps, I hoping from my tutorials people cant learn more about the event system in Intersect.